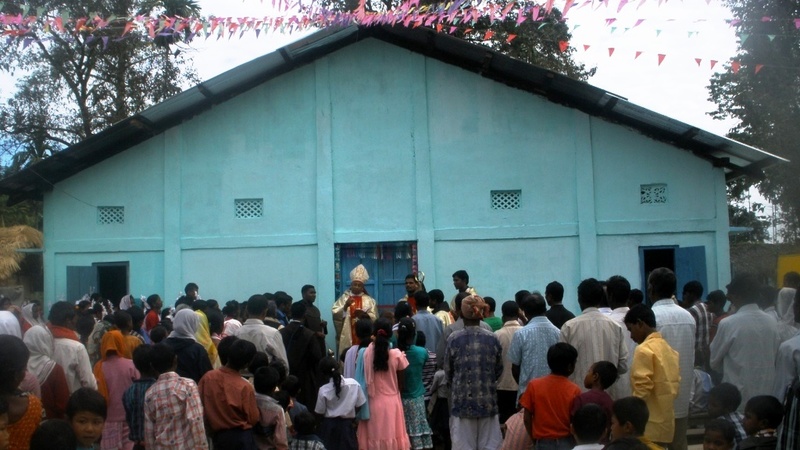 Kumari: Sengapathar, the oldest Catholic community under Kumari Parish, rejoiced at the blessing of the new Church on 22nd November 2013, by Bishop George Pallipparambil SDB, in the presence of a big gathering of faithful. Sengapathar, a big Catholic community with 6oo faithful, had a humble church made of bamboo with thatched roof. With a little help from a few people of good will, the faithful built this church from their own little contribution. Bishop George addressing the congregation on the occasion congratulated the people for saving from their own little income to build this Church. “This is an example of what we can do if we are determined to achieve something. I congratulate all the faithful of this village for the sacrifice they have made to make this church a reality,” he said.